Now here’s a nice little something you could serve for tea. 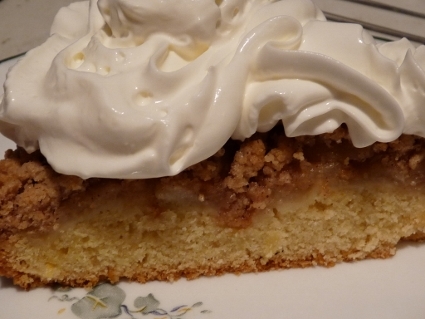 It has yummy apples, a crunchy spiced crumb topping and a cake like bottom that has a hint of fresh lemon. 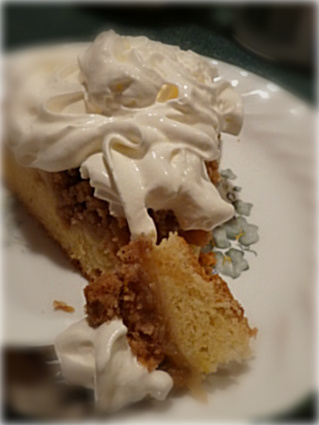 "Spice is Nice Apple Cake" is great with whipped cream! I got the recipe from my favorite all time food blog “The English Kitchen” where Marie made it but with plums. 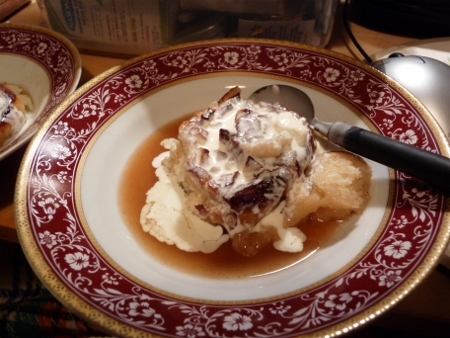 I changed a few things, I wanted to try apples instead of plums, didn’t have Cardamom so I just used mixed spice, and I didn’t have sour cream on hand so I used vanilla yoghurt. It came out fine and dandy, I think I’ll add more apples next time though! Isn’t everything better with whipped cream? Here’s the recipe as Marie presented it and my notes of what I substituted in case you want to try it either way. Spooning cream, Clotted cream, vanilla ice cream, or whipped cream! 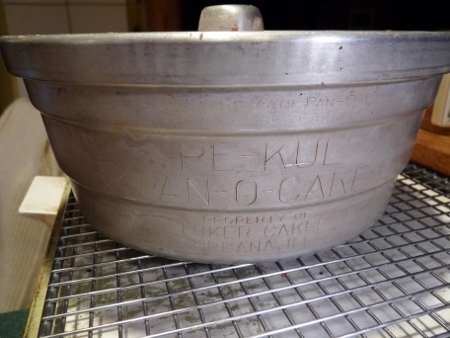 Pre-heat the oven to 375F/180 C. Butter the bottom of a 10 inch cake tin with a removable bottom. Cut a circle of parchment or baking paper to fit bottom and stick it on, then grease over it again. 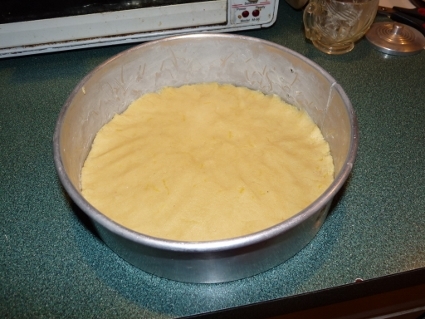 Grease the sides of the pan with butter now; the cake won’t rise much so don’t go crazy with greasing up the sides high. (as I found out). This is my lemon zester, the recipe calls for grated zest but I used mine which makes shreds of peel. It was fine but I am guessing grated zest would be better. Cream together the butter and sugar until light and fluffy. Beat in the egg, lemon zest, vanilla, sour cream and salt. You can use a mixer for this step. Whisk the flour and baking powder together and then add it to the creamed mixture, the dough does get really stiff when you add the flour, you may need to go by hand at some point! It’ll be stiff like cookie dough, plop it into your pan and pat it out with your hands, if it sticks to you just rub a bit of butter on your hands and try it. Pat the dough evenly into the pan. 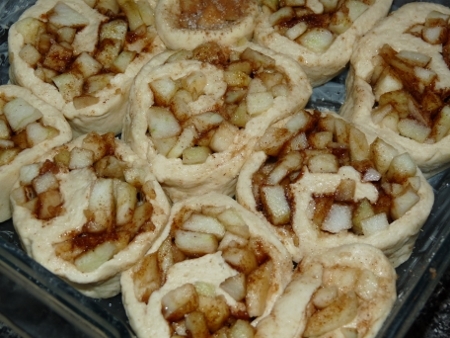 Liberally spread the apples over top of the batter to within 1/2 inch of the edges, keeping the slices flat on the dough. 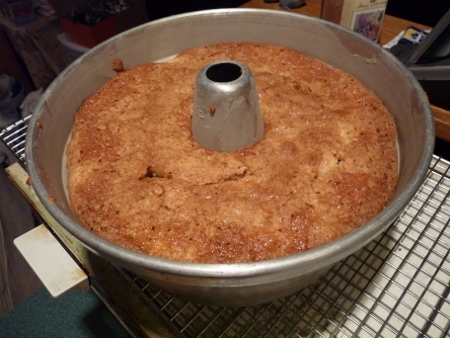 To make the streusel, whisk together the sugar, flour and spices. 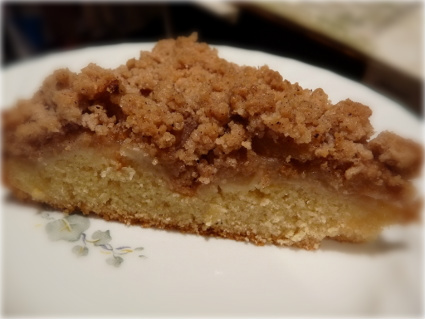 Cut in the butter with a pastry blender then use your fingers until the mixture is crumbly. 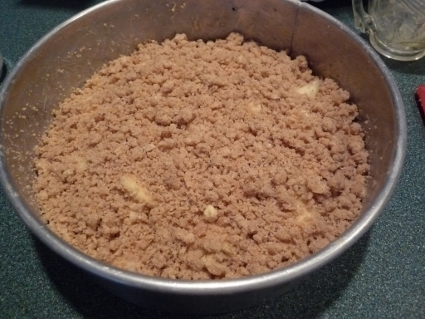 Sprinkle the crumbs evenly over top of the apples. Bake in the pre-heated oven on a middle rack for approximately 45 minutes to one hour, until the topping is nicely golden brown and the cake tests done. Remove from the oven and allow to sit for about 15 minutes on a wire rack, before you remove the sides of the pan and the paper. Baked golden brown and crispy on top! The house was filled with the great smell of apples and spice! It was actually bubbling a bit from the juices. 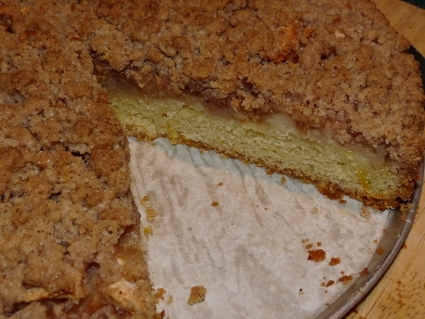 You can see it's a short cake, 'cake/tart/crumble' ! Delicious on it's own too, you can even pick it up to eat in your hand. Serve warm, cut into wedges with some whipped cream or ice cream. 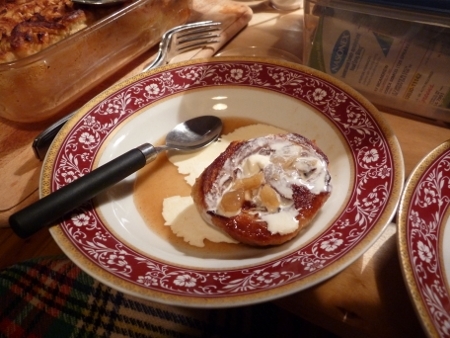 I’m’ thinking it’d be good even with an apple cinnamon sauce around on the plate! 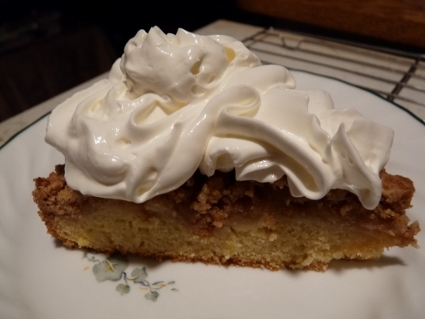 I made this using apples, 2 cups peeled and sliced which was two regular good sized apples, Cortland + Macintosh. I think Granny Smith for one would have been tastier. Next time I’ll try more apples, like 2 ½ c? 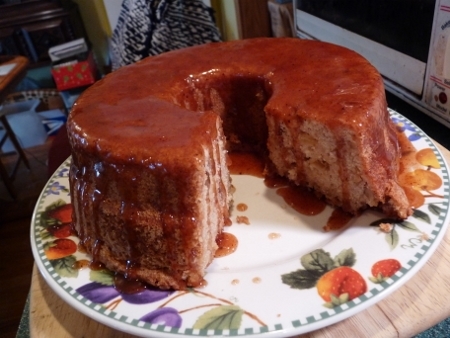 It was excellent but the cake I found a bit dry….I did bake it 59min., maybe it was too long? Top was perfect and crust perfect…so I don’t know. Is it because I didn’t use the plums? Anyways, after covering it and trying a piece later on it was better! I am a fuss pot. I didn’t have sour cream so I substituted vanilla yoghurt. 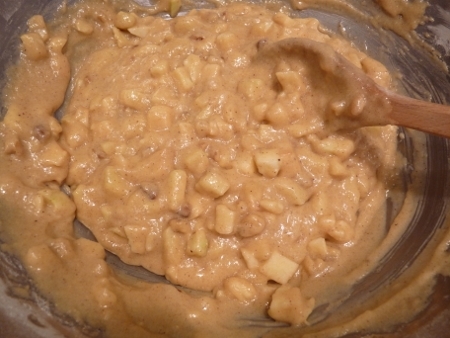 I also didn’t have Cardamom so I used ½ tsp of mixed spice and grated a bit of fresh nutmeg in. I also used a hand mixer which I hardly ever do now…the base dough is REALLY stiff, like cookie dough, might not use it again. 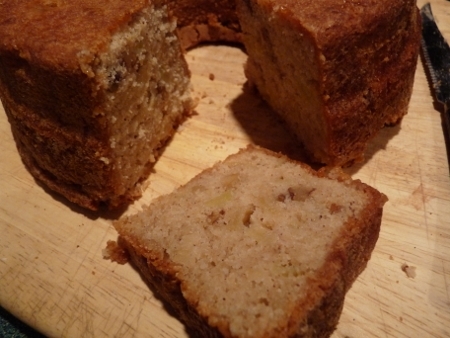 "Spice is Nice Apple Cake"
“Spice is Nice Apple Cake”, I hope you try it, let me know how you’re comes out if you do! Apple Dappy Makes Me Happy! Apple Dappy, I think it was the name that first grabbed me, it sounded like something from an English children’s storybook. Or something you’d hear in a nursery rhyme…hmm…if there isn’t one maybe I’ll make one up someday. 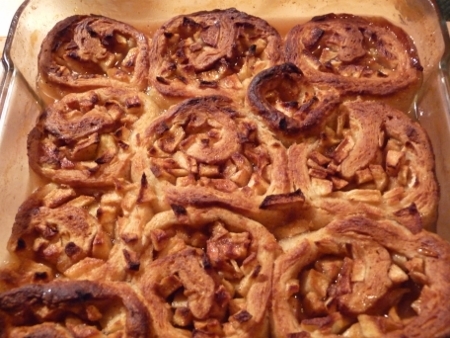 oh yum…spices, apples, pastry and lemon sauce….ohhh can’t wait! I saw the recipe in a very old cookbook I have in England, “Farmhouse Kitchen II”, a great little paperback that’s full of traditional recipes by housewives from all around Great Britain. It has no photographs so I had to use my imagination to think of how it might look. It was a stab in the dark to say the least…I mean I never made a recipe where you poured a lot of liquid over dough, I worried it might be sloppy, heavy and wet but it wasn’t! 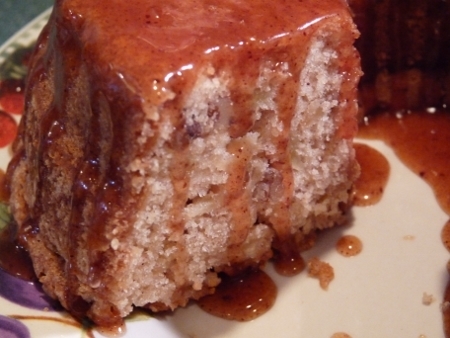 Apple Dappy is baked with a wonderful fresh lemon sauce over it! In England “Pudding” or “Afters” refers to having dessert in general. 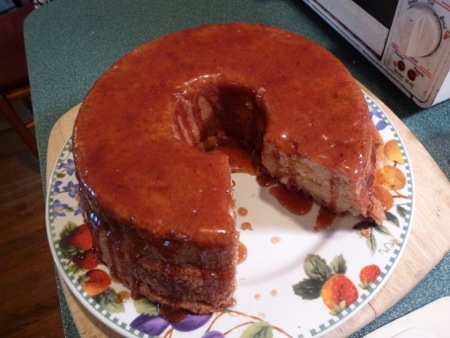 A popular type of pudding is made by using dough and fruit then baking with liquid over it, I think an example would be “Eve’s Pudding”. You can see all the juicyness in the photo above after I scooped out some servings. Cool, fresh cream drizzled over the hot roll and lemon sauce, oh wow! I spooned some of this lemony sauce over the ‘roll’ then we drizzled single cream all over the top; you can also serve it with custard. Now pouring cream on a dessert or liquid warm custard are also new things to me (in America), it’s very “British”! (my boyfriend loves custard on everything). Served in a bowl hot, spongy and crisp at the same time. I was happy with the results and glad my boyfriend approved as I love to bake for him and especially try to learn traditional recipes. Believe me when I say it was EASY! Really! Here’s the recipe then a few pictures of it unbaked for you to see after. 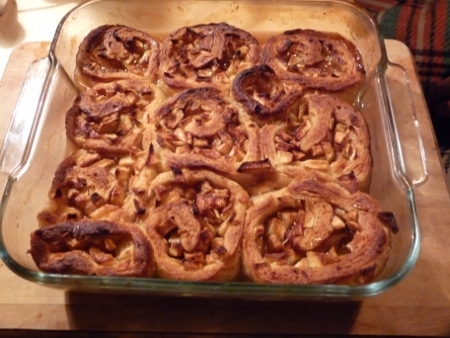 First you make the sauce then the apple roll with an easy scone type dough. 1. 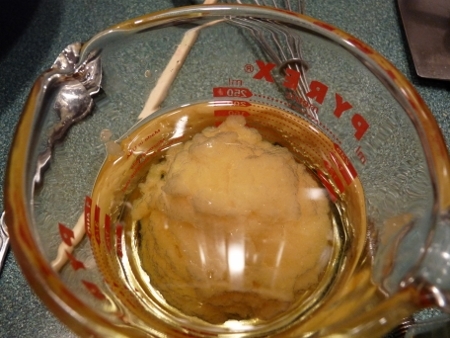 Grease a 8″ or 9″ square dish (I used my glass pyrex) with butter. Turn on oven to 375 f / 190 c.
3. Sift flour, baking powder and salt into a bowl. 4. Rub butter into flour, or use pastry blender then rub in till it looks like breadcrumbs. 6. Peel, core, slice then chop up the apples, my recipe took about 2 c of chopped apples. Put them on the pastry but keep them away from edges. 7. 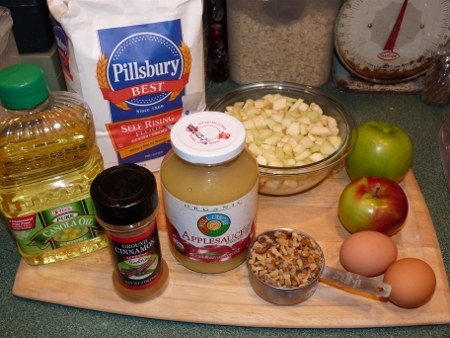 Mix spices with brown sugar in a small bowl, sprinkle over the apples. (* The original recipe called for a mixture of or one of the spices, to equal 1/2 tsp. I used all I listed and it was great, I don’t think it’d be as good if it didn’t have the spices.) 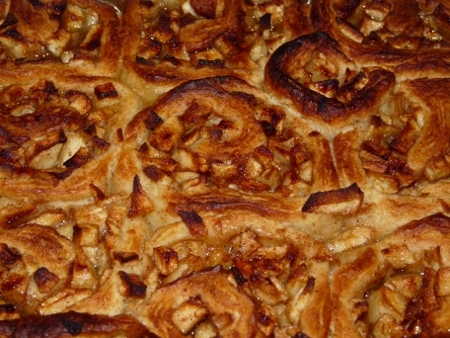 Then roll up pastry and apples like a swiss roll, pinching to seal edges, then cut into 1″ thick slices. 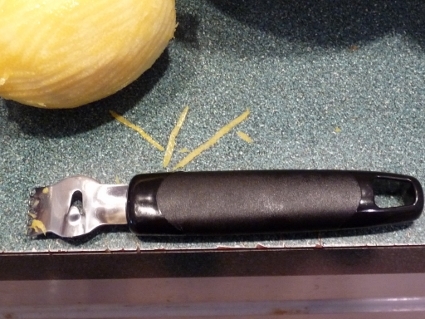 Use a sharp knife and cut carefully, use your fingers to hold the roll in place when you cut gently. 8. 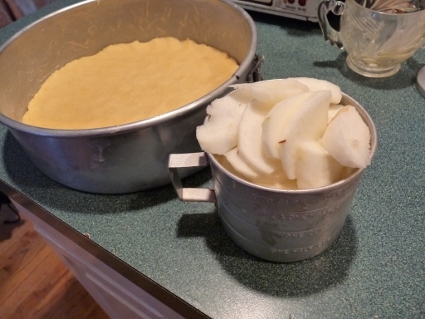 Grease a 8″ or 9″ dish, I used my pyrex dish, and lay slices on their sides in the dish. 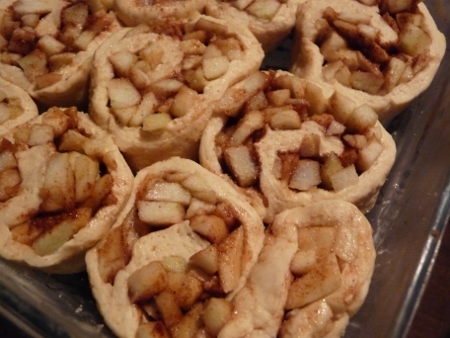 Arrange to make them fit and take the little bit of dough that’s left from the ends and push more apples into them then tuck into spaces between rolls. 9. Remove lemon rind from syrup and pour over slices. Make sure you taste the drippings in the pot, it’s really good! Bake 375 f / 190 c for 30-35 min. (mine took 35 in a little oven) Serve with cream or custard. ** Don’t miss my notes at the end! Recipe from Joan Guy- Tavistock, Devon from the “Farmhoue Kitchen II’ book. Here’s how it looks unbaked, all the rolls pushed into a dish, 8×8″ or 9×9″, they will puff and raise up quite a bit so make sure the pan isn’t too shallow. 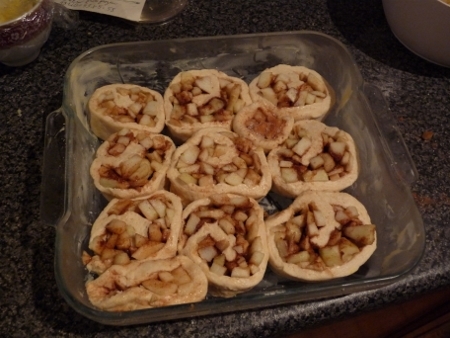 You can see how chock full of apples it is, I thought it’d be way too much as I rolled it and pushed to keep them in. No…just right! 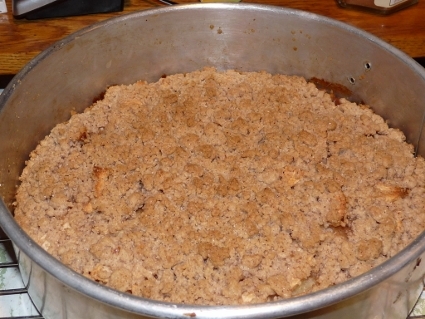 Apple Dappy unbaked close up. 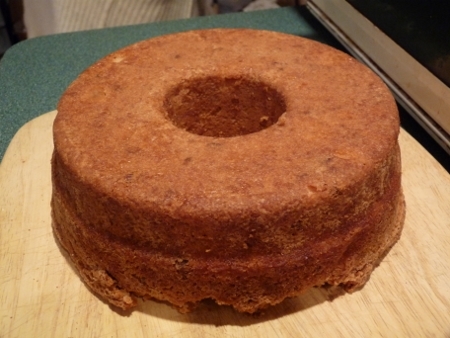 **You can see where I squished one of the end bits into the corner here; it was mostly dough so I pushed some apples into it and sugar spice mixture and just fit it in. There were two pieces left from either end of the roll. **I forgot to mention, I made the rolls up a few hours before dinner and let them sit in the dish without the sauce. I put the sauce ingredients together in a pan but didn’t heat it. 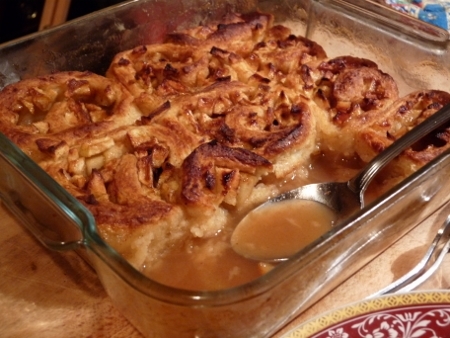 When dinner was done I heated the sauce, then poured it over the waiting pastry, popped it into a preheated oven and just waited as the house filled with wonderful smells of apples, cinnamon and lemon. Please let me know if you try to make this, I’d love to hear how it comes out for you. I think it’d be tasty made with apples and rhubarb too, or apples and raisins. Any other ideas? I can’t wait to have leftovers tonight! Did you know I’ve been taking some great photos along with my paintings of the English countryside and nature while in Northumberland England? Visit my Zazzle Shop to see all the great pics, look under Landscapes-England. All are printed on glossy heavy weight stock if you decide to order any.